Manitoba Women in Construction: Building P.E.O. 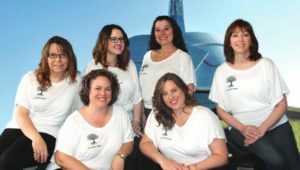 Ellowyn Nadeau, Lori Garet, Sheena Braun, Lindsay Arseny, Sonia Perrino and Kim Planck are six recently-initiated members of Chapter H. Winnipeg Manitoba, Canada and are all associated with the construction industry in one capacity of another. CCA Panellists address creating gateways for women in construction!